What is it about Asians and catfish? The only people who can compare with the Asians in cooking these largely unloved fish are the cooks of the American South. This dish hails from Sichuan, in northwest China, and it is an absolutely great way to eat small catfish, especially bullheads. I’ve adapted this dish from Fuchsia Dunlop’s excellent book Land of Plenty: A Treasury of Authentic Sichuan Cooking. The marinade removes any muddy, fishy smell and taste, and the chile bean paste and garlic do the rest. Don’t freak out about the two heads of garlic in this recipe — the cooking process leaves the cloves nicely mellowed. I designed this dish for bullhead catfish, but any fish 8-12 inches long will work fine; small trout, rock cod, mackerel or bass, as well as big crappies or sunfish would be great here, too. Do your best to get the real Chinese ingredients here, as it makes a significant difference in flavor. If you can’t find the ingredients nearby, you can order them online (links are below) or substitute as you can. The only thing that really can’t be substituted for in this recipe is the chile bean paste. 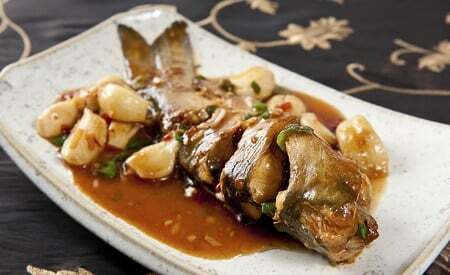 Wash the fish well and marinate with the Shaoxing wine and salt for 30 minutes to 1 hour. Heat the lard or oil in a wok over medium heat and gently cook the garlic cloves until they are a little wrinkly on the outside, but still white. Do not let them brown. Set the cooked garlic aside for now. Turn the heat to high. Pat the fish dry with paper towels, and when the lard is hot, fry the fish in batches for 2 minutes per side. Set the fish aside as you finish. Pour off all but 3 tablespoons of the lard (save the excess for another Chinese dish). Cook the chile bean paste in the oil for 30 seconds, stirring often. Add the ginger and stir-fry another 30 seconds. Pour in the stock and bring to a boil. Add the soy sauce and sugar. Gently put the fish in the wok and bring back to a boil. Turn the heat down to a gently simmer and cook the fish 6 minutes. Carefully flip the fish over and add the garlic. Cook another 6 minutes. Remove the fish and garlic to a platter and turn up the heat on the sauce. Boil the sauce furiously until it has been reduced by 1/3, about 3-4 minutes. Stir the potato starch mixture and stir half into the sauce. If it is thick enough for you, stop. If not, stir in the other half of the potato starch mixture. Let this boil 1 minute. Turn off the heat, add the green onions and the vinegar, and pour the sauce over the fish. Serve immediately with white rice. I added about a teaspoon and a half of coarsely ground Sichuan peppercorns with the bean paste–amazingly good.